Cihuapilli Rose Amador and Sundust Martinez interviews Lakota Harden (Minnecoujou/Yankton Lakota and HoChunk) on Native Voice TV. Lakota Harden (Minnecoujou/Yankton Lakota and HoChunk) is an orator, activist, community organizer, workshop facilitator, radio host and poet. She has dedicated her life, as a daughter of seven generations of Lakota leaders, to liberation and justice. 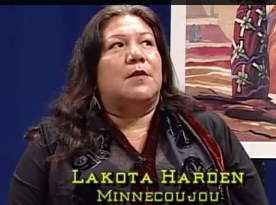 Harden explains that ‘Lakota’ is not from the ‘Sioux’ tribe but means ‘Allies’ as spoken by the Lakota tongue. Harden was born in an ‘American Indian Movement’ (AIM) family. She speaks about the times of how it was in the 70’s in Pine Ridge and speaks about her stories given to her by her elders – ‘Pre-Invasion’. Harden has much to say from her experiences from the past to the present. She is very amazing and tells the audiences what it means to be Native American.